CAIRO — The Egyptian Parliament approved sweeping measures on Thursday that would allow President Abdel Fattah el-Sisi to extend his rule until 2034, further entrenching his authoritarian rule and enshrining in law the military’s dominance over the country. The vote by Parliament, whose workings are quietly managed by Mr. el-Sisi’s intelligence agencies, sets in motion a fast-moving process of constitutional change that could culminate in a referendum within three months. The referendum’s approval is seen as a foregone conclusion. The changes formally confirm what has become evident to many Egyptians for years: The sweeping euphoria of 2011, when protests led to the ouster of President Hosni Mubarak, has given way to an even harsher brand of strongman rule under a leader who also intends to rule for decades, and perhaps for life. Washington’s unquestioning embrace of Mr. el-Sisi, whom President Trump has called a “great guy,” emboldened the Egyptian leader to act with little fear of American pushback. The proposed changes would allow Mr. el-Sisi, who is scheduled to step down in 2022, to run for two more six-year terms and would demolish the constitutional safeguards he introduced in 2014, a year after he came to power in a military takeover. Mr. el-Sisi would have the power to appoint judges and the country’s prosecutor general, while the top judiciary would be stripped of its ability to vet draft legislation. The military, which the amendments declare as the “guardian and protector” of Egypt’s Constitution, would control the appointment of the defense minister. In Parliament, 484 of 596 lawmakers approved the changes, starting a process of deliberation and debate that is expected to led to a second, final vote two months from now. If that passes, a referendum would be held within one month, probably before the start of the holy month of Ramadan in early May. 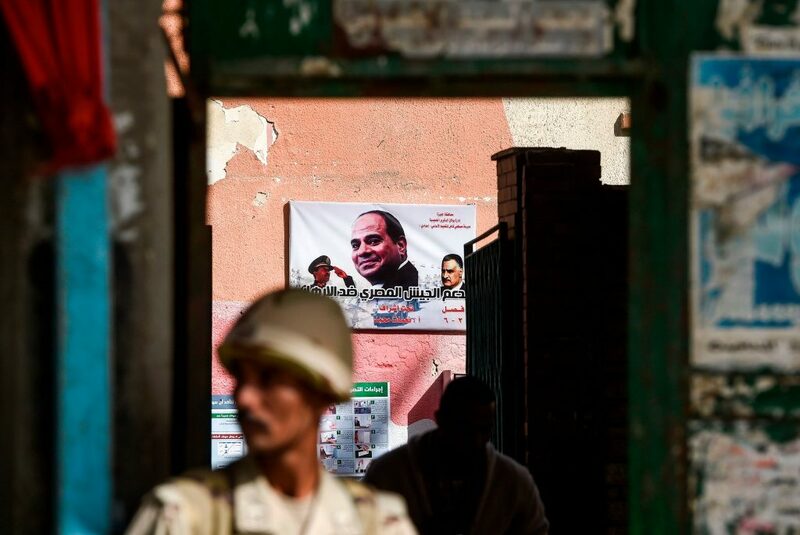 But within months of a flawed presidential election in March, which Mr. el-Sisi won with 97 percent of the valid vote, his supporters started to raise the idea of constitutional amendments. Supporters say that Mr. el-Sisi needs to extend his rule to introduce urgent economic reforms and to stabilize Egypt after the turbulence unleashed by the Arab Spring in 2011. In speeches, Mr. el-Sisi frequently refers to chaos in Libya, Syria and Yemen as dark examples of what Egypt could become. Many Egyptians share those fears. But stability has come at a high price in terms of civil liberties and human rights. The country has jailed tens of thousands of opponents, banned hundreds of websites and exerted tight control over the courts. The news media is almost entirely under government control and torture is common in Egyptian prisons, rights groups say. Despite those abuses, Mr. el-Sisi has been bolstered by strong support from Western and Arab leaders who view him as a bulwark against Islamist militancy as his forces fight an insurgency in Sinai. Secretary of State Mike Pompeo lavished praise on the Egyptian leader during a visit to Cairo in January. In 2017, President Trump posed with Mr. el-Sisi and the Saudi king over a glowing orb, in a widely mocked image that, nonetheless, framed America’s preferences in the Arab world. The French president, Emmanuel Macron, visited Cairo recently to sign weapons deals, the latest of several European countries to cash in on Egypt’s appetite for multibillion-dollar arms purchases. As lawmakers voted on Thursday, Mr. el-Sisi was in Munich for a global security forum. In recent months, the General Intelligence Service, one of Egypt’s three major security services, has convened near-daily meetings to coordinate plans for extending Mr. el-Sisi’s term, according to Mada Masr, one of the few independent news media outlets in Egypt. The meetings were led by the president’s son, Mahmoud el-Sisi, who is a senior official in the General Intelligence Service, the outlet reported. In Parliament on Wednesday, Speaker Ali Abdel Aal told lawmakers that “all opinions and trends” would be incorporated into the debate about the changes. But Western diplomats in Cairo say the government seems intent on pushing them through as swiftly and as quietly as possible. Media outlets have given only cursory coverage to the constitutional amendment. Live television coverage of often-chaotic parliamentary proceedings ended in 2017. Diplomats say that opposition lawmakers have been warned to temper any public criticism of the amendments. Egyptians ignore such warnings at their peril. Three of Mr. el-Sisi’s rivals from last year’s election remain in jail, and last week a court jailed 26 members of a grass-roots campaign that had opposed his re-election. Mr. el-Sisi’s desire to push through the amendments now may be driven by Egypt’s faltering economy, analysts say. Harsh economic overhauls instituted by Mr. el-Sisi have won him praise and a $12 billion loan from the International Monetary Fund, but they have stirred quiet discontent among Egyptians struggling with soaring prices and cuts to fuel and electricity subsidies. But his haste may also be influenced by the vagaries of American politics, said Andrew Miller of the Project on Middle East Democracy, a nonpartisan organization in Washington. With the special investigator’s investigation bearing down on the Trump administration, this is a good moment to make a contentious move with Mr. Trump’s full, unfettered support, he suggested. “El-Sisi may see this as the safest time to seek relief,” he said. Though the changes approved by Parliament on Thursday are provisional and could change before the final vote, as they stand, rights groups warn, they will seriously undermine judicial independence in Egypt.